Matchy-matchy home décor certainly has its place in the world of interior design – think austere white rooms – but most people decorate using pieces that have been acquired over the years from many different sources. So, how can you take that one step further and successfully mix and match fabric patterns with a room without making it feel like a three-ring circus? One best practice is to start with the largest piece of furniture in the room –a sectional, sofa or bed – and use a neutral fabric for the upholstery of that piece. Textured neutrals are even better and can include colors such as white, cream, taupe, beige or even grey, one of the newest neutrals. This gives you a solid foundation on which to build your family of patterns. Now, move on to mixing and matching while keeping color in mind. Remember that darker and bolder colors make a room look more dramatic. If you want to make a statement, consider draperies and decorative pillows in the same bold fabric pattern. Using some of the same colors repeatedly helps tie them together and makes you look like a decorating pro. Sunbrella fabrics are made from a common color palette or yarns, so it is easy to coordinate the fabrics with each other without things going awry – stripes with florals, solids with geometrics and so on. Interior designer Kate Jackson discovered this in her repeated use of blues and oranges throughout the living room, dining room and backyard in the Perspective New England Beach House. Love Kate’s colors? 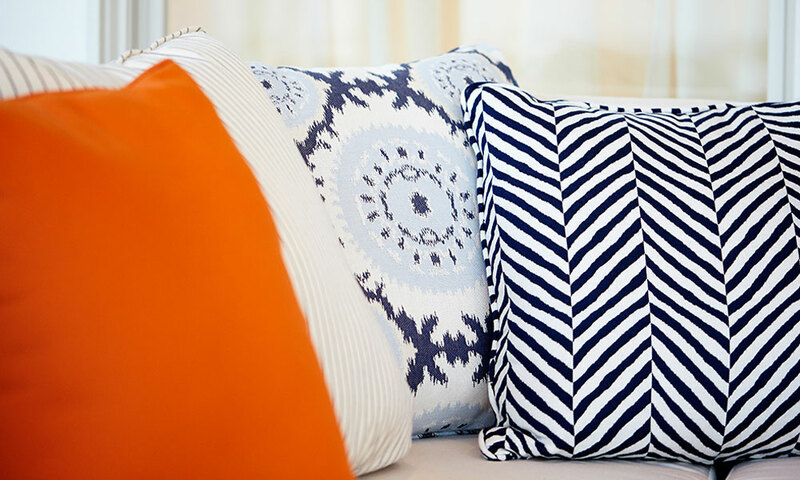 Buy one of the decorative pillows featured in the beach house living room and add a pop of orange to your home’s interior design. For a more neutral pattern, purchase the decorative pillow covered in Sunbrella Cara Marine, which features thin grey stripes on a white background. First, pick your strongest, largest fabric pattern, whether it is a large-scale ikat, overlapping geometric or wide stripe. Then select a second very different pattern with a scale that is half the size of the first. Your third fabric can be something completely different – such as a floral or even a solid. Stay within the color palette you’ve already established for consistency. For expanded décor options, use a pattern for the front of a pillow and a solid for the back side. This works particularly well if the pattern is a more expensive fabric and you need to extend your budget. Patterns can have a big impact on the feel of a room when you walk into it. Lots of large-scale patterns used in the same room do not evoke a soothing vibe, but rather up the energy level in the room. Simple or calm fabric patterns and colors will bring a calm feeling to the room. Keep this in mind as you begin your decorating process. And because you began with a neutral base, when you feel the need to freshen up the space it’s as easy as switching out pillow covers and accessories for an entirely new look.